Motor yacht ALLAHOU was built by the German shipyard Lurssen in 1965 and beautifully refitted to a modern, luxurious charter yacht in 2016. Measuring 33.00m (108' 3”), she is able to accommodate up to ten charter guests in a comfortable and inviting environment and a cabin layout that includes five staterooms. Her crew of five offers highly-professional service throughout the entire vacation. On the main deck aft there is a row of sun-exposed seating along the stern and beneath the upper deck overhang, a port corner sofa around an elevated table creates a relaxed alfresco dining area. On the foredeck, there is a massive Jacuzzi for the group to soak, socialise and enjoy the views. On the bow, a triple sofa/sunbed provides a place for guests to dry off and savour the sunshine. On the flybridge, the aft section is used for storing the tenders and water toys, which are launched and retrieved using a Davit crane. The central section is furnished with two L-shaped sofas and a drinks table to create a laid-back lounge open to the elements. The broad beam provides spacious guest accommodation on the lower deck which consists of a Master suite as well as three double cabins and a twin cabin, all with en-suite facilities. The crew accommodation is also placed on this floor, leaving the main deck free for a raised pilothouse and an open-plan salon stretching from the forward formal dining area to the rear door to the main deck aft. Within the interior is a forward formal dining area consisting of a port C-shaped sofa around a fold-out raised dining table with two additional chairs. Behind, an elongated C-shaped port sofa creates an ideal place for the group to come together and relax at any time of the day, with a widescreen TV on the forward starboard wall for entertainment. To the aft, a square table with four canvas chairs creates a casual breakfast area that receives plenty of daylight through the surrounding windows. A pair of 1350 BHP 12VMTU 493 engines produces a top speed of 27 knots with a cruising speed of 20 knots with a range of 500 nautical miles. 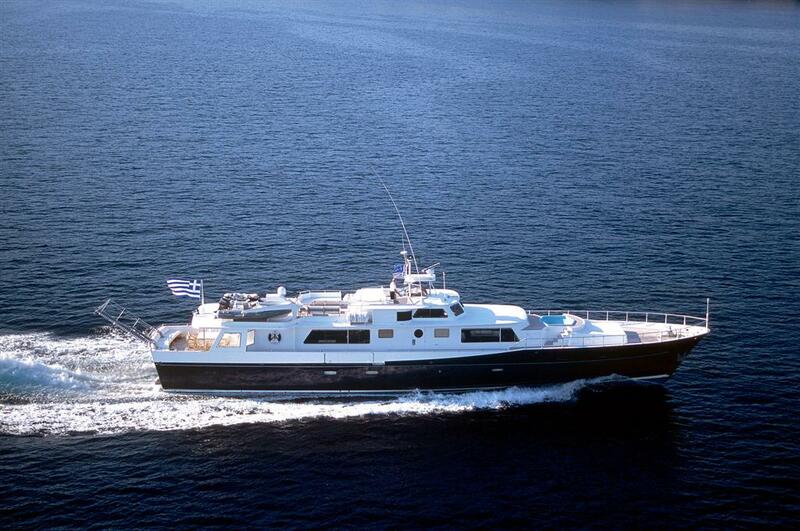 A five-cabin layout provides guests with modern and high-quality accommodation that sleeps up to ten charter guests. This includes one master suite, three double cabins and one twin cabin. All staterooms have their private ensuite bathroom facilities.